I had 5 tortillas left-over from the burritos we made over the weekend that were going stale, so I decided to make a large pot of tortilla soup. I use the tortillas as a thickening agent in the soup, and also as a garnish on top of the dish. To the tortillas I added tomatoes and tomato paste for a little tartness, jalapeños for a little heat, and some kidney beans and soy chorizo for protein. 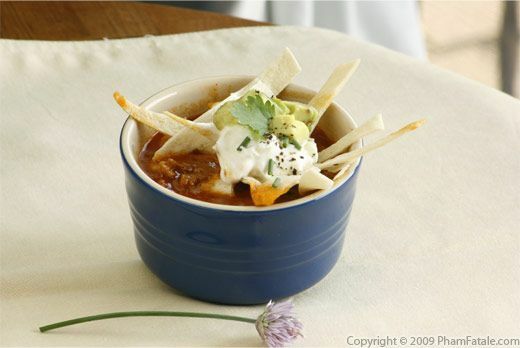 The spices give the soup an earthy flavor and the Cotija cheese and sour cream that I top each serving with are very soothing for the taste-buds. 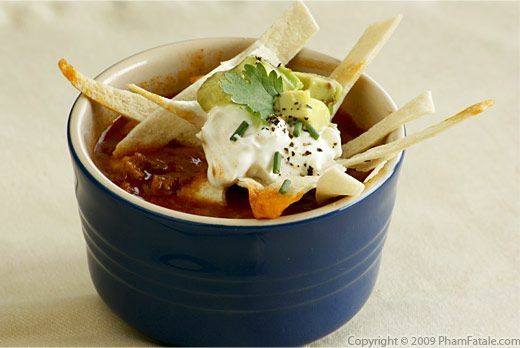 Tortilla soup is a really hearty dish that's the perfect cure for the dreary weather we've been having here as of late. Stack all the tortillas. Halve them, turn them 90° and cut them into 1/4-inch strips. Place them on a greased baking sheet, drizzle about 2 tablespoons of avocado oil and bake for 10-12 minutes until crispy. Reserve a few strips for garnish. In a blender, combine the roasted bell pepper and roasted jalapeño. Add a little vegetable broth for a smooth flow. Set aside. In a pot, heat 2 tablespoons of canola oil. Add the onions. Cook for a few minutes until translucent. Transfer them to a platter and set aside. In the same pot, add the minced garlic. Cook until slightly golden. Add the soy chorizo. Stir frequently. Cook for about 2-3 minutes. Season with salt and pepper. Transfer to another platter. Set aside. In the pot, add more canola oil (if necessary), the sprig of oregano, bay leaf, cumin powder, red chili flakes, fried onions, diced tomatoes, tomato paste and red kidney beans. Stir well. Add the vegetable broth. Bring the liquid to a boil, then lower to a simmer for about 10 minutes. Add the tortilla strips. Cook for about 10-15 minutes. Stir in a tablespoon of cilantro and the lime juice. Remove and discard the bay leaf and sprig of oregano. Using an immersion blender (or transfer to a regular blender), lightly blend the soup. Season with salt and pepper. Turn off the heat. Add the soy chorizo and Cotija cheese. Drizzle with lime juice and avocado oil. Ladle the tortilla soup into bowls. 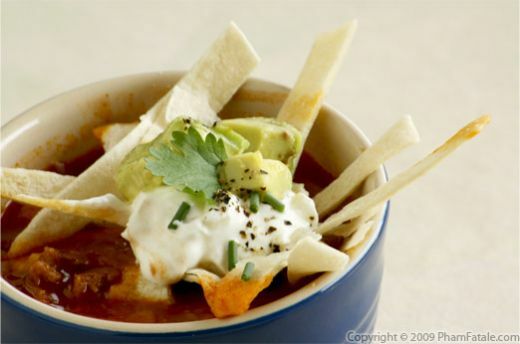 Garnish with a few strips of tortillas, diced avocado, a dollop of sour cream and sprinkle with a little black pepper. Top with more cheese and finely snipped onion chives if you like a stronger flavor. Finish with the remaining cilantro. I used Cotija cheese to keep the Mexican theme but you can use any other cheese you like, such as shredded cheddar cheese. If you like your soup spicier, you can blend 1 (4-ounce) can of drained chopped green chiles in addition to the roasted bell peppers and the roasted jalapeño pepper. 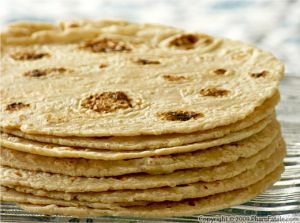 I used store-bought tortillas but you can make your own tortillas at home. 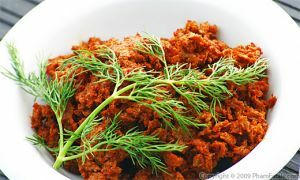 The vegetarian chorizo (click on the link for the recipe) has a similar texture to ground beef. Soy chorizo is also available in regular stores such as Safeway and Trader Joe's. I use avocado oil because of its exquisite artichoke-like aroma and its thick consistency. Since this oil is fairly expensive, I only drizzle it over the tortillas and at the end as a finishing touch. You can find it at most specialty food stores or online. Little reminder on how to roast (red bell pepper and jalapeño) peppers: Once you know how to make them yourself, you'll never buy the ones in a jar again. To start, cut the stems off the peppers. Wash them, pat them dry and brush them with oil. Place a grill on your stove and char all the skin of the peppers. Wrap in aluminum foil. Let cool for about 5-10 minutes. Clean the peppers using a knife; the skin will come right off. Seed them and finely chop the flesh. Voilà! 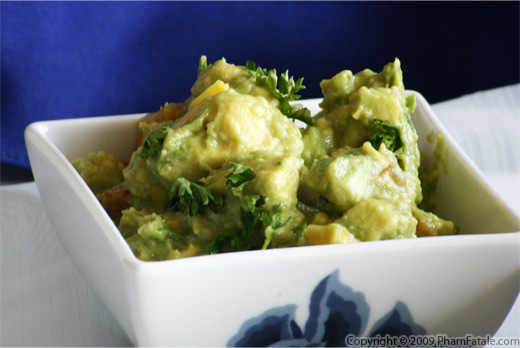 If you want to make sure the diced avocado remains green, just drizzle a little lime juice over it before serving. You can also garnish the soup with guacamole if you like. Published By: Jacqueline Pham on October 20, 2009. MMMMMMMMM,...Jackie!! Your soup looks terrific!! 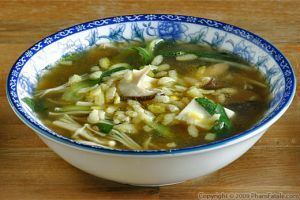 As I sit here trying not to sniffle all over my keyboard, I'm wishing there was a huge bowl of this right in front of me! It looks marvelous and sounds so amazingly flavorful. I'd love to add guac but the avocados we are getting here have been absolutely miserable: they go straight from unripe to decaying. I may have to resort to pre-made guac . 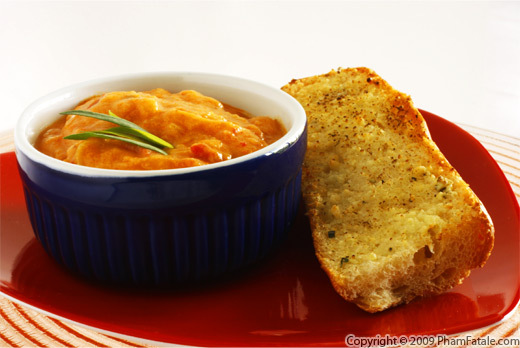 . . No matter - there's plenty of deliciousness to be had in this soup! Learned about a new product here today....avacado oil! Yum! It's so beautifully presented. I like one-pot soups like this, so comforting and hearty.